Venezuelan opposition leader and self-proclaimed interim president Juan Guaido accompanied by his wife Fabiana Rosales, speaks to the media in Caracas, Jan. 27, 2019. Canada will host an "urgent" meeting of the Lima Group to discuss the political crisis in Venezuela, the Canadian foreign minister, Chrystia Freeland, announced Monday. The group, which includes Canada and 13 Latin American countries, will convene on February 4 in Ottawa to discuss how to support opposition leader Juan Guiado, who declared himself interim leader of Venezuela despite disputed President Nicolas Maduro's victory in 2018 elections that were widely boycotted and believed to have been rigged. Guaido has called for demonstrations for two days this week in his latest bid to bring the country's military to his side and away from Maduro. First, Guaido called on Venezuelans to mount a peaceful, two-hour, midday protest Wednesday "to demand that the armed forces side with the people." Guaido also asked his supporters to be "in every corner" of the nation and around the globe and take to the streets this coming Saturday, a move that coincides with a European Union deadline for announcing a new election. Opposition followers -- some shouting, "Soldier friend, you're the only one missing" -- handed out leaflets describing the amnesty plans at military and police posts. Maduro maintained Sunday that the military is on his side as he watched military exercises using Russian-built rocket-propelled grenades and anti-aircraft machine guns. "Nobody respects the weak, cowards, traitors. In this world, what's respected are the brave, the courageous, power," Maduro said as he watched bullets from the Russian artillery pound a hillside. 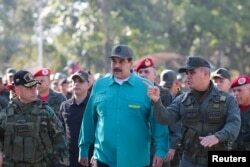 Maduro said he wants peace, but also announced more military games for February. He says they will be "the most important in the history of Venezuela." Also Sunday, Maduro rejected an ultimatum from a number of European countries that he hold new elections within eight days, or they will formally recognize Guaido as president. Two weeks after he was inaugurated for a second term this month, Venezuela's opposition-controlled National Assembly declared Maduro's presidency illegitimate. Guaido, the National Assembly leader, invoked the constitution and declared himself interim leader pending a new election. 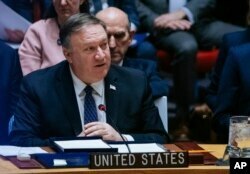 U.S. Secretary of State Mike Pompeo told members of the U.N. Security Council Saturday to "pick a side" in Venezuela. He called the Maduro government an "illegitimate Mafia state" and criticized countries that support him, including Russia, China, Iran and Cuba. Pompeo, however, warned Maduro not to "test the United States on our resolve to protect our people." Pope Francis Sunday called for a "just and peaceful solution" that respects human rights in Venezuela. He spoke as he was wrapping up a visit to Panama. 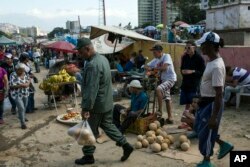 Workers and customers gather at a wholesale food market in Caracas, Venezuela, Jan. 28, 2019.